It's super fun to experiment with accessories so when I saw this crescent shaped bangle I figured it could be definitely worn in more ways than one. Considering I have a weakness for gold shiny chokers at the moment I realised that with some wrangling this piece could not only be worn as a bracelet but a neck piece too. The result I felt was just out a little bit 'crafty'..
Love the shirt, and that bangle-necklace-thingy is awesome! I Love you!!! Your style and images are just so beautiful and inspiring!! Nice idea, to wear it as a necklace. Really pretty! I love your boots!! And I think that that *is* a creative way to wear a bangle - it looks pretty good as a neck piece. I agree about the craftiness. This is a perfect pre-halloween outfit. 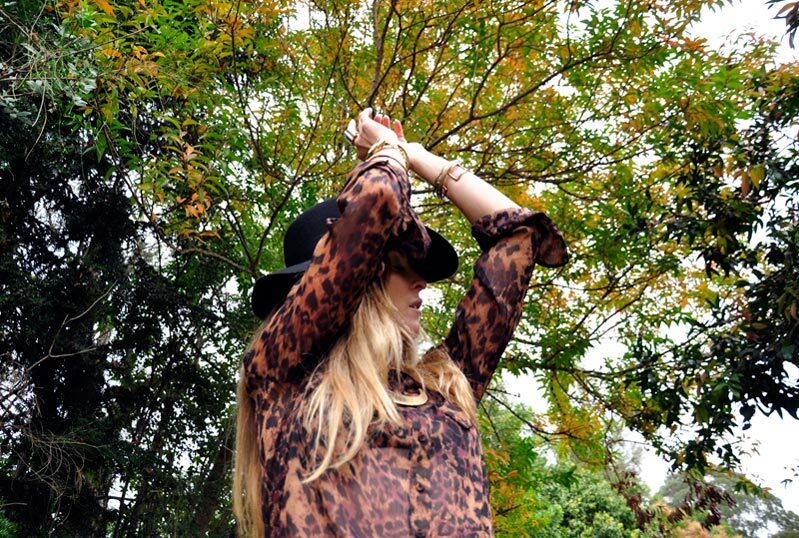 Smitten with the leopard print shirt and floppy hat. It looks great as a necklace. Looks very much like autumn in Oz. Lovely self photography. God! I love it when you do outfit posts! You look amazing! The bangle is great as a necklace. What a great outfit, love it! love your shirt! and that necklace! Loving the bangle and its versatility! Maybe it's been asked before but I need to know how you photograph yourself like this? Do you use a tripod or? The medium brim felt fedora is a great accessory for this season and a great update to the straw fedora and floppy hats from last summer. 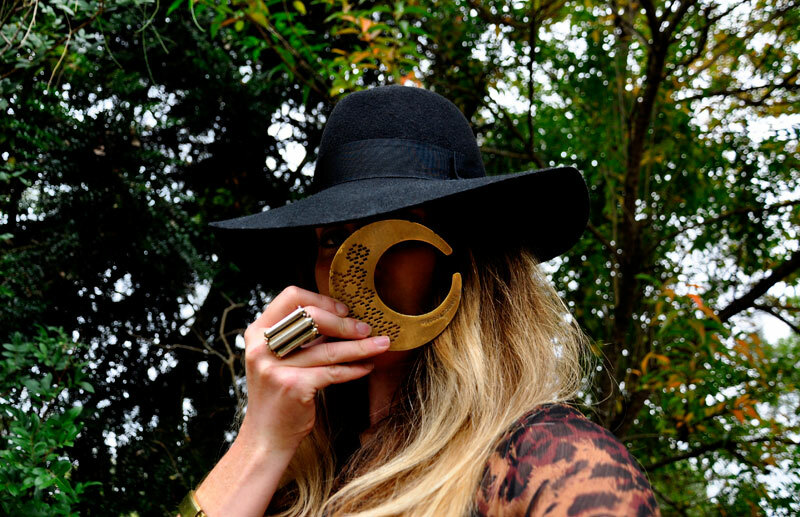 That is such a great way to wear a bangle! Oooh Mandy - I have that Low-Luv ring, love it, except it's almost a weapon due to it's heft. How you think up these ideas I have no clue, but keep it up! Love the bangle worn either way, and you look amazing as always! Your sense of style is absolutely stunning...There is so much creativity and specificity about it...Love it!!! that shirt is absolutely gorgeous! 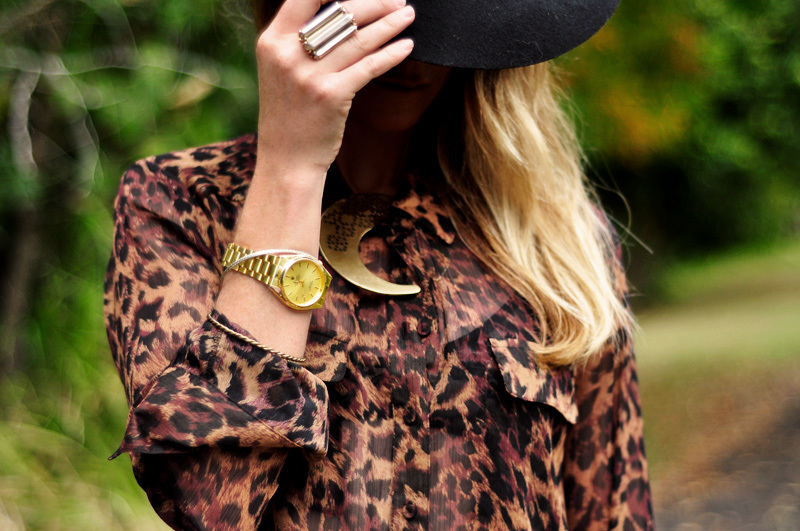 i really love leopard print, especially paired with that hat! 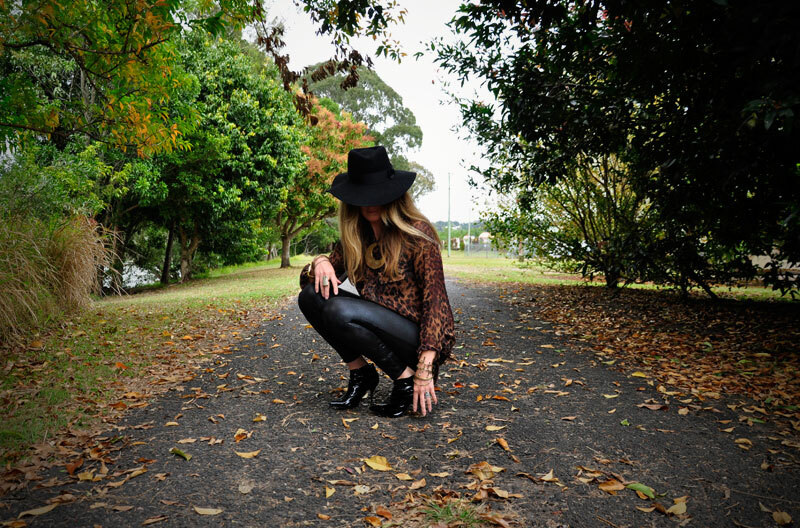 Lovely style very Erin Wasson, the blouse is really cool and of course I love the hat. i love your outfit shots, always so inspiring. love the title of this post too. As I am totally amazed to see the most curious outfit from this source. It's authentically looking one of the stunning personality stuff.